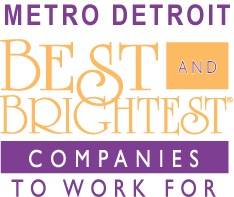 For the second straight year, LMCU has earned inclusion as one of Metro Detroit’s Best and Brightest Companies to Work For®. Sponsored by the Michigan Business and Professional Association, this honor is reserved for companies that distinguish themselves as having the most innovative and thoughtful human resources approaches. LMCU will be honored on Thursday, September 17, 2015 at an awards ceremony at the Detroit Marriott Renaissance, downtown Detroit. LMCU earned this same honor at the national level last year, and also in the West Michigan area for the past seven years.